Summary: Women are becoming more influential in business. They also control more than half of personal wealth in America, so are a growing client segment. Key opportunities abound for wealth management and small business loans. A recent study shows that women outlive men in almost all populations. Males and females were studied in seven different populations with harsh conditions such as famine and epidemics. At every age, women were found to live longer than men. While social factors and environment have varying effects on female longevity, extremely high infant mortality populations showed "fundamental biological underpinnings" of female survival. We thought creative bankers might be able to leverage this information in some way so we share it this morning. 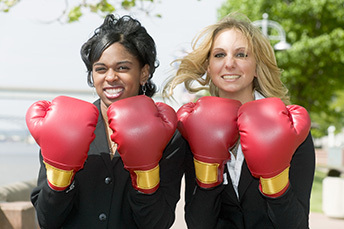 Women are advancing and community banks may find opportunity arising alongside. The number of women on the boards of Fortune 500 companies has jumped to 20.0% at the end of 2017 vs. 15.7% in 2010. The number of startups run by women is also outpacing men. Millennials seem to accelerate this trend, as more young women are enrolled in graduate schools and they are earning a larger number of advanced degrees than their male colleagues. This avalanche of good news in favor of women could be an opportunity for community banks to attract customers that are doing well and gaining power. Two specific business segments seem especially promising: wealth management and small business loans. Women control more than 50% of the personal wealth in America, and still according to the Boston Consulting Group, only 2% of banks specify women as a client special interest. The opportunity is even greater for loans. A survey recently conducted by Dun and Bradstreet and Pepperdine University shows that only 30% of women who own their company could get a loan from their bank during the previous 3 months, vs. all owners at 50%. When thinking about future debt financing in the next 6 months, 44% of all interviewees said it would be easy, only 21% of the women thought the same. To back this perception up, research by Northeastern University and Babson found that women receive smaller loan amounts than men, even when they present similar corporate performance and have the same number of employees. Things are shifting, as a few big banks are already changing their approach. Bank of Montreal earmarked $2B for women entrepreneurs and other banks have done the same. Now is a good time for community banks to jump in too. Research from Kantar UK also shows that women are 2x as likely as men to recommend their bank if they are satisfied with their latest transactions. Not only that, women have also been found to maintain greater savings, mortgage & insurance products than men. Knowing all of this, it may be worthwhile to take another look at your marketing plan. See if you are maximizing your efforts in this key customer segment, and if not, strategize with your management about reaching out to more women. Make no mistake, women business owners are an influential group. It may be as easy as tweaking a few marketing messages to give your bank that one-two punch of opportunity. FASB issued its proposal for adjusting capital balances due to the unexpected effects of the new tax plan. The proposal indicates an adjustment between accumulated other comprehensive income (AOCI) and retained earnings, which will permit ending regulatory capital to be appropriately stated in addition to avoiding arduous operational requirements to keep track of the amounts that would have been "stuck" within AOCI. For more information on the new tax plan and how it may affect your community bank, download our white paper. A UBS survey of banking habits in 19 countries finds 78% of lenders believe digital banking will reduce operational costs, while 15% say it will increase costs. Bank of America reports its digital user base increased to 34.9mm at the end of 2017 vs. 32.9mm in 2016. Most gains were in the number of mobile users, as this channel usage increased 34% YoY. Citing concerns due to some loosened underwriting and higher CRE concentrations, the OCC recently announced credit, operational and compliance risks as its top supervisory priorities for 2018. It sees asset quality and underwriting as remaining strong overall, despite increased competition, but is concerned as well about cybersecurity threats targeting bank personnel, processes and technology. Bank of America is eliminating its remaining free checking accounts and will require customers to leave higher balances to avoid fees. All customers must now pay a $12 monthly fee, unless they have $250 or more in a direct deposit or leave a minimum daily balance of $1,500 or more. According to CIO Journal, IT spending in 2018 is projected to top $3.7T, an increase of 4.5% over 2017. CIOs say they are looking to invest in blockchain, Internet of Things, cloud and AI in coming years.